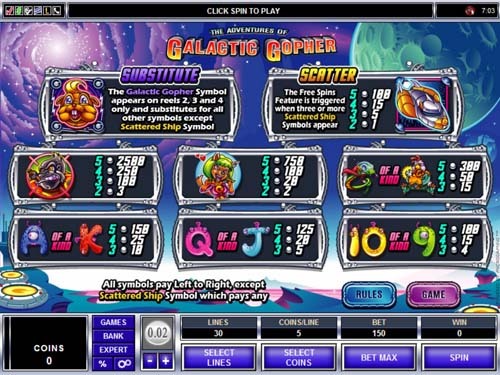 With the action of The Adventures of Galactic Gopher being set in space, Microgaming managed to make a pretty good sci fi themed slot machine out of it, taking creatures from Earth and making them into inhabitants of outer space and of alien planets. You have an interesting choice in this game, a very well designed title with a cartoon style being used in it which I’ve enjoyed, certainly good enough to be the basis for a kid’s TV series. You will find 5 reels in this game, with a maximum of 30 active lines. As features, the game has free spins, multipliers that come from rocket ships, scatter symbols and wilds. The prizes might not be impressive, but $7,500 isn’t something to sneeze at. You get the big four features that most great slot machines will include, starting with the wild which has a multiplier, and then getting the free spins with the help of the scatter symbol. The wild has the Galactic Gopher as its representative, the image being a close-up. As a wild, it can be used as a substitute for pretty much any regular symbol, without being able to do anything about a scatter. Wilds are only allowed to appear on the 2nd, 3rd and 4th reels, but even though they’re limited that way, they offer a 3x multiplier for any win that is awarded with their contribution. The Space Ship is the scatter feature, which will be able to appear on all the reels of the game. You can get paid up to 100 times the triggering bet if you have enough of these scatter symbols present, and the best thing about it is the ability to be in any random position when it gives you prizes and free spins. 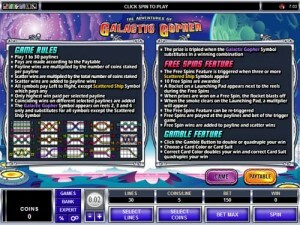 Like it pretty much always happens, access to the free spins is obtained with the help of the scatter symbol, the Ship in this case. The usual 3 or more Ships have to be in scattered locations on the reels, in order for the player to get the 10 free spins which are offered. 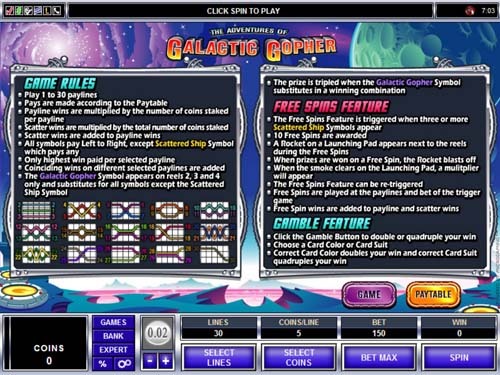 While the free spins are used, you will notice a Launching Pad with a Rocket on it, which is placed in the vicinity of the reels. Whenever you get a prize, the Rocket blasts off and leaves behind it a multiplier for that round. 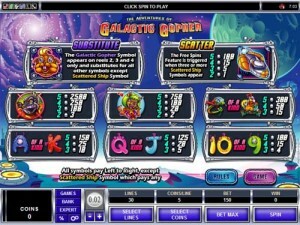 The slot will put 30 lines in front of you, and you will decide on how many you want to place your wager. The minimum line bet is $0.01, the smallest value of one coin. The largest coin value is $0.20, and you can use up to 5 per line, so the maximum line bet is $1. Taking that into account, you can calculate that the maximum bet is worth $30. The 7,500x top prize that you can win in the game will put 37,500 coins in your account, which means $7,500. The whole alien adventure theme is one that I enjoy, especially when it’s done so well. There are human animals that act as humans and a lot of aliens which are made to look like playing cards, a nice way of integrating them into the game and making the cards a bit more bearable. A beautiful alien landscape is used by the game as a background, with a planet that is inhabited visible in it, plus a beautiful view of space at the top. Symbols: Gopher (wild), Ship (scatter, 100x the bet), Ape (2,500x), Dog (750x), Snake (300x), Chicken (300x), Ace (150x), King (150x), Queen (125x), Jack (125x), 10 (100x) and 9 (100x). I’ve enjoyed the design and the theme, the features being more on the average side, but still interesting. Overall, a game that should be given a chance if you’re a fan of the science fiction category. 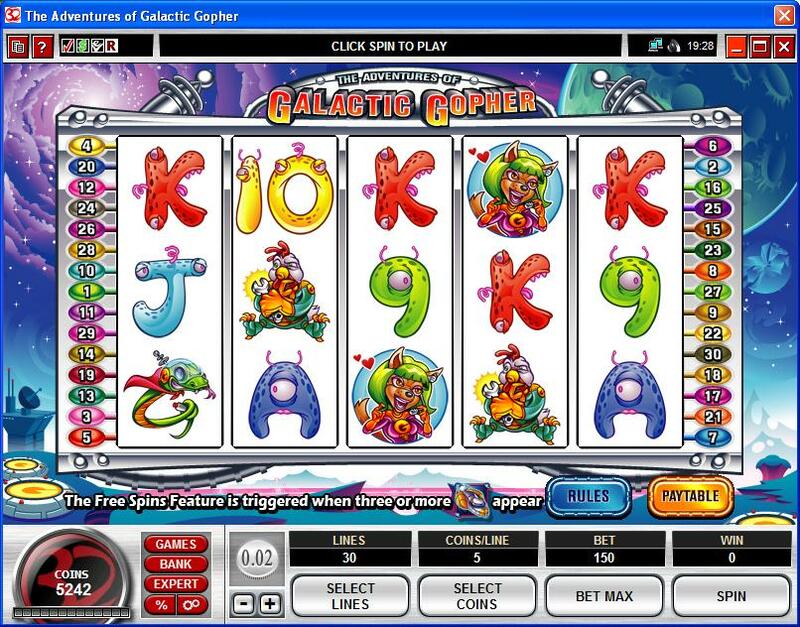 You will find The Adventures of Galactic Gopher at any online casino which chooses to use software from Microgaming, playable either for free or for real money.